I've made us some Peanut Butter Cookie Dough Ice Cream and it's the most delicious thing ever. It's also a healthier dairy-free/ vegan dessert recipe, but you would never know it. Go on, have a second scoop. You know you want to! To celebrate, I've made us my favorite ice cream ever. This is what I get when I go to those mix your own ice cream shops. Always peanut butter. Always cookie dough. Apparently, I turned 5-years-old this week. I tried to make us a more grown-up ice cream flavor earlier this week. Since I'll be heading into a new decade next year, I thought it might be time I grew up. You know, develop more refined taste and all that. But the first ice cream I made wasn't calling my name. I mean, it was good, but it wasn't peanut butter cookie dough ice cream kind of good. What I have done is made my fav ice cream a little healthier. Don't worry, you'll never know. When I handed that ice cream cone with the single scoop to my handsome man (it's my birthday, I got the double scoop!) he was floored it was vegan. He's my gauge about whether a vegan recipe is good enough to share with you guys. He usually makes all sorts of faces when I say things like vegan or dairy-free. If he raves about a vegan recipe (cause he can't tell it's vegan) then I know it's a winner. Want to know why this healthier version is a dead ringer to real (ie: dairy loaded) peanut butter cookie dough ice cream? Here's the thing, most vegan ice cream recipes are made with coconut milk and there is NO WAY that coconut milk based ice creams will ever taste like the ice cream you are trying to recreate. Unless you want coconut ice cream, you should never use coconut milk as the base. Trust me on this one, I've tried many many times and am always disappointed. Maybe I'm too much of a perfectionist. But hey, I want the dairy-free ice cream I'm making to taste like what I'm flavoring it with. That's where cashews come in. They're a neutral base that won't flavor your ice cream. 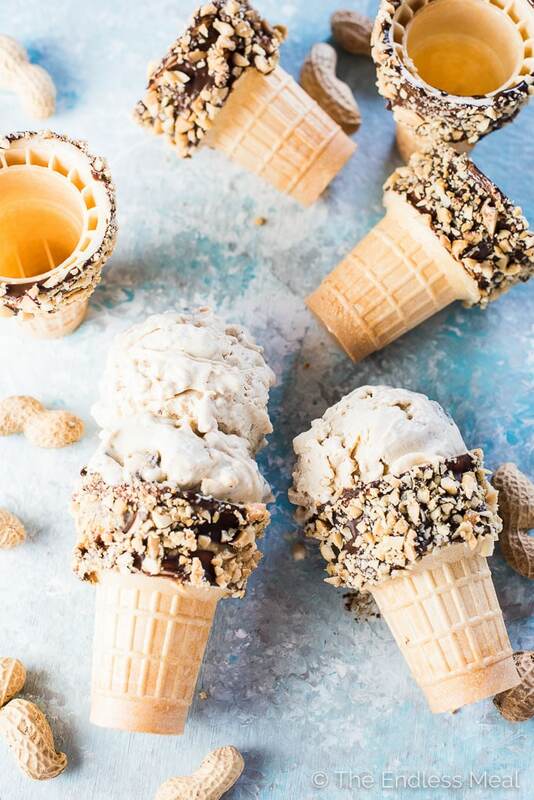 If you use cashews, you can have any flavor of ice cream you want. Plus, their high fat content makes the ice cream super creamy, just like regular ice cream. 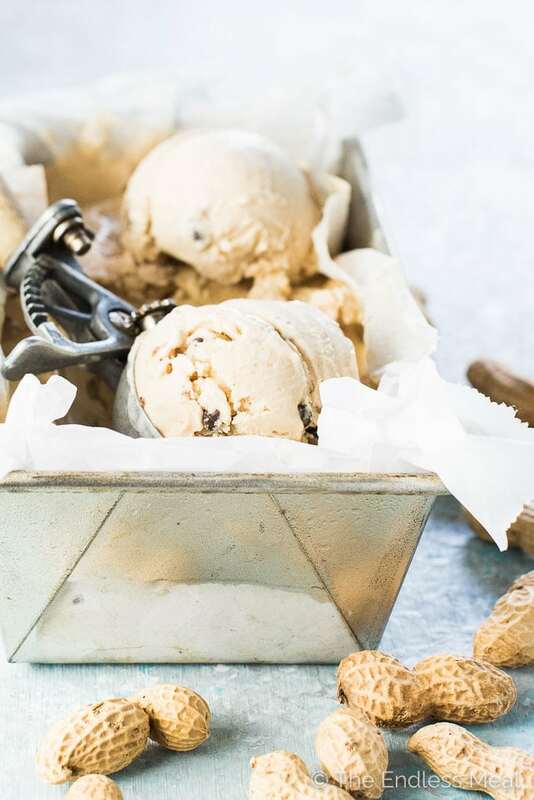 Why should you choose this healthier peanut butter cookie dough ice cream recipe? 1. It's insanely delicious. I believe that the most important reason you should make any recipe is that it tastes amazing. 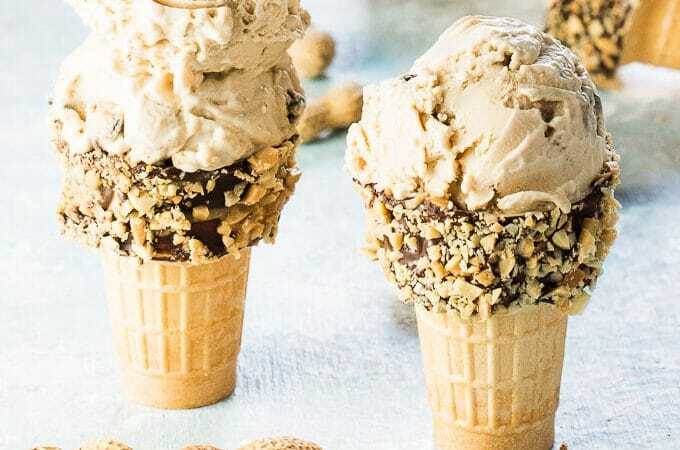 This ice cream has a creamy, peanut buttery base and is loaded with tons of cookie dough bites. 2. Cookie dough. Lots and lots of cookie dough bites. You know when you buy those little tubs of ice cream and each time you reach in with your spoon you're hoping, fingers crossed, that you'll come up with a chunk of cookie dough? Ya, that doesn't happen with this ice cream. There's enough cookie dough to have some with every bite. Just the way it should be. 3. Dairy-free means it's better for you. I'm not vegan, and you don't have to be to eat this ice cream, either. Here's the thing, I can eat a giant double scoop of this ice cream and still feel great. No tummy aches. No feeling heavy. Just a big happy ice cream induced smile. 4. It's summertime. This is a real reason! Summer only lasts so long, and we should celebrate it every chance we get. 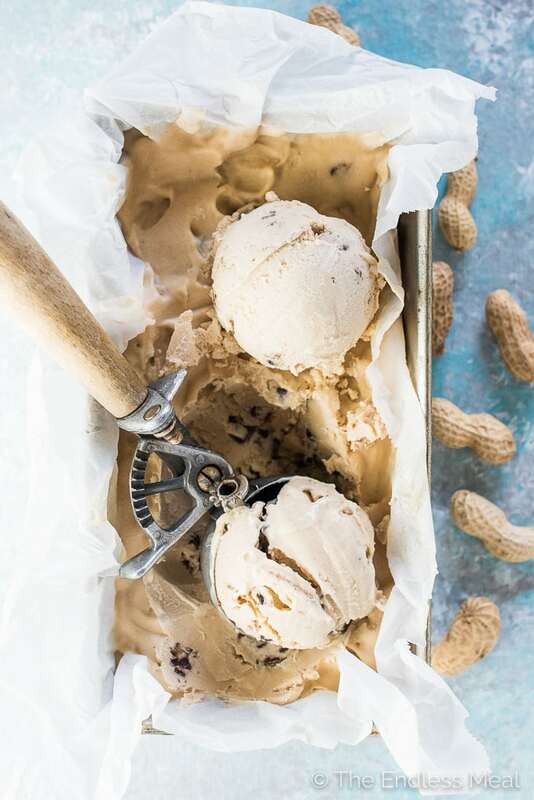 Peanut butter cookie dough ice cream seems as good a thing to celebrate with as any. You with me? Let's do this, my friends! Place the cashews in a jar (I use a 2 cup Mason jar) and cover them with water. Place the cashews in your fridge and let them soak for 4-24 hours. Rinse the cashews under cold running water then add them to your blender or food processor. add 1 1/2 cups of fresh water, the peanut butter, and sugar. Blend on high until completely smooth. Note: if you don't have a high-powered blender, you may want to strain the ice cream through a fine mesh sieve so it is smooth. Place the blended cashews into your fridge and let them cool completely, about 1 hour. In a medium sized bowl, mix the coconut oil or butter and sugar with a fork. Add the flour and vanilla and mix until a dough is formed. Stir in the chocolate chips. Break the dough into small pieces and place them on a small baking sheet. Place the tray into your freezer to freeze the cookie dough. Pour the blended cashews into your ice cream maker and process according to manufacturers directions. Once the ice cream is firm, stir in the frozen cookie dough bites. Transfer the ice cream to a freezer container and freeze. Pour the blended cashews into a large, shallow baking dish and sprinkle the frozen cookie dough bites over the top. Place the dish into your freezer. After half an hour, remove the dish from your freezer and scrape the ice cream with a spoon to mix it up. Place it back in your freezer. Repeat the scraping and freezing until the ice cream is frozen, about 3-4 times. Transfer the ice cream to a freezer container and store in your freezer. If you have a high-powered blender you can skip the soaking step. If not, soak the cashews for as long as you possible to help soften them. I always use salted peanut butter. If you only have unsalted on hand, add a pinch of salt to the ice cream. I’m a total sucker for peanut butter and cookie dough so when this popped up on facebook the other day I knew I had to make it. It did not dissapoint! I only wish it made more. Will be making it again! Sounds like we have the same taste!! Looks delicious! Agreed, cashews is magical! It can turn into cheese, ranch dressing, ice cream, cheesecake, frosting, cashew butter, cashew milk, cashew yogurt, and, of course, cream! I definitely need to start working with soaking cashews and cooking with them. Peanut butter cookie dough is also one of my favorite flavors! I’ve never used them to make yogurt, but that’s a great idea! I’m going to start!